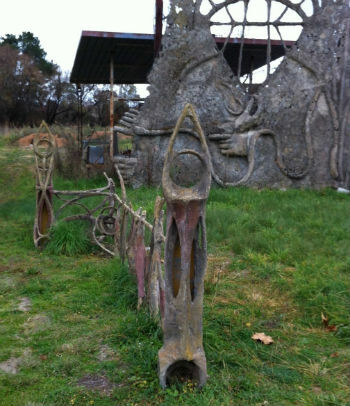 In the village of Collector, (population c.300) halfway between Goulburn and Canberra, stands an amazing piece of folk art. It was begun in 1993 by Tony Phantastes, an outsider artist of Dutch origins who is married to Emmy King. Emmy is the niece of famous German-born Australian sculptor Inge King, who moved to Australia from Germany and had been involved with the Bauhaus. She died last year at the age of 99. 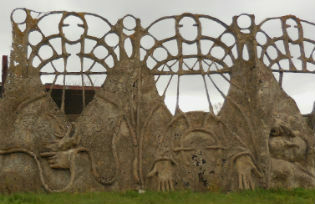 Tony worked on the site for seven years, but the sculpture was never completed. 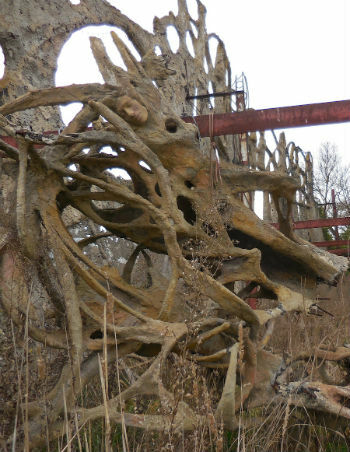 Problems arose with the local Shire Council, who considered the sculpture to be an eyesore. They issued a stop work order and later scheduled it for demolition. The Land and Environment Court also became involved in the controversy. Tony eventually won the right to leave it on the site, which he has owned since 1992. However he was obliged to pay his and the council’s court costs, which amounted to $30,000. It took a great deal of time for the courts to reach the final judgment, making it a long drawn-out ordeal for both Tony and Emmy. Tony’s original plan was to have the whole structure covered in paint and use color on it. He also envisioned the plot of land as a whole gallery-studio site complete with landscaping. The framework is an elaborate skeletal concretized structure. It features hands, feet and the face of his first son. The face was created from a plaster cast made well before the son died of cancer at 23. Originally begun as a homage to his father, Dreamer’s Gate became a memorial to Tony’s son and a monument to the bushranger territory it stands on. While Tony worked on the sculpture, his wife stayed in Canberra and looked after the kids. Nevertheless he still had to come home every night as the hostility of the local people made staying overnight in Collector rather difficult. A hippy friend used to live in trailers at the back of the structure, but later moved on. I think Tony may have left the trailers there out of spite because the local people treated him so badly, but that is just conjecture on my part. It all seems rather sad, since it really is a beautiful sculptural wall, and would have been truly amazing if he had ever completed it. As it stands it has a ghostly elegance, in tan and windblown concrete and wire, sitting by itself in a small town which seems quite boring by comparison. 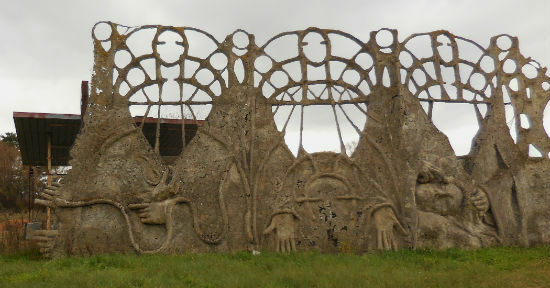 Tony has himself continued to work with strange concretized structures of this type. Right now he also works with homeless youth. Tony’s daughter Annika recently moved to Canberra to study, and hopes to build a home behind the sculpture at some point in the future, since Tony still owns the land. Perhaps she will eventually see to its completion. Who knows? It reminded me of Watts Towers in Los Angeles, the Postman’s Gate in France or the work of Nikki de St Phalle both in the USA and France. If it had been allowed to be completed it would have made an attractive addition to the Art environment of Australia. Many thanks to Emmy King and Tony Phantastes for their help on this article.